Hi everyone sorry I've been MIA. Alas my playroom is an icebox so I've not been trying to organize the chaos. Much less doing any crafting. I've been working on painting, hanging pictures and decorating for the holidays. Trying to turn the house into a home and making it guest ready as long as they don't plan to spend the night. LOL! 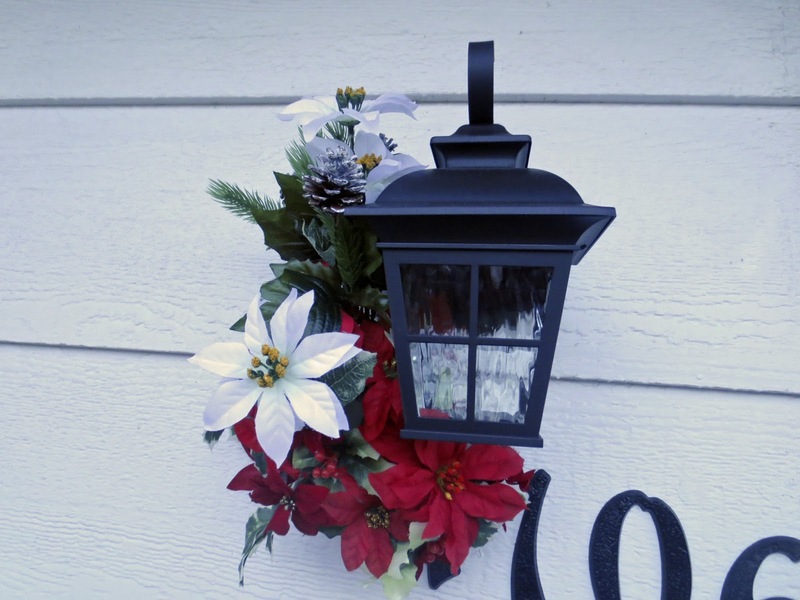 I wanted to do more than just have a wreath on the door and lights and garland on the railing. I saw an idea for decorating the porch lantern light and decided to try it. I already had a wire hanger. Although those are getting more difficult to find. I may have to see if a dry cleaner will either sell me some or give me a couple. I bought floral foam at Dollar Tree and at a thrift store picked up artificial flowers. Not that I didn't have any but I'm clueless where they are. In less than an hour I ended up with this Christmas decoration to provide cheer to those passing by or knocking on the door. Good thing I tried hanging it before adding the flowers as I had to cut the foam in half. I realized later that I should have cut the foam so it was not so thick. Also I should have left the hanger a little longer. I'll do that next time when I create a Spring one. I went ahead and put flowers on the sides as well as the top since I wasn't sure what was going to show or not show. 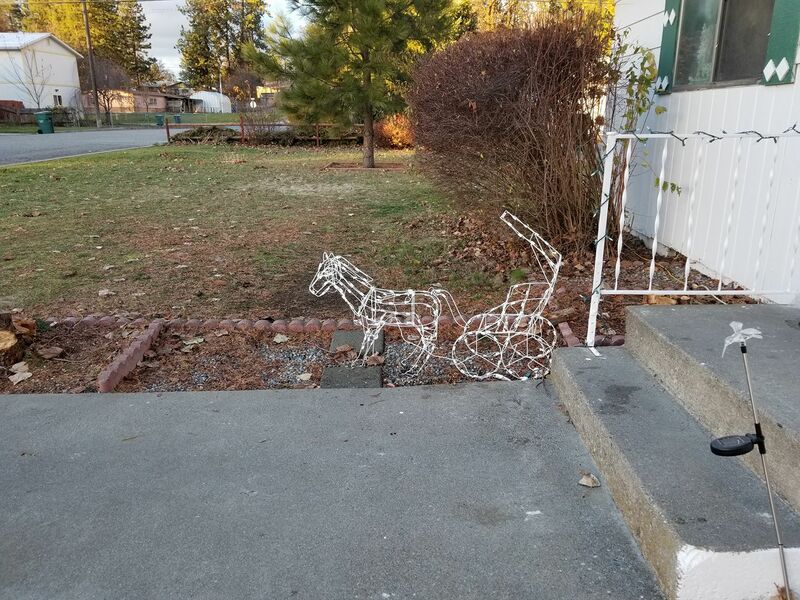 It was too cold to work on this outside and constantly putting it up to see how it was going to look. I think it turned out well and I have an attractive decoration for under two dollars. Off to do more unpacking and maybe even baking some cookies. Nothing turns a house into a home faster than wonderful scents. Hi everyone today over at Hiding In My Craft Room the challenge is the color challenge. This week the challenge is to use Christmas colors. I know most of us think of red and green as being Christmas colors. I also though think of the color purple which is the color of advent which heralds the Christmas season. Of course purple is also my favorite color and I needed an excuse to use the purple glitter paper I've been hoarding. This week the challenge is being sponsored by The Paper Shelter who graciously provided me with the gingerbread image which is a black and white image. My printer did a weird thing when I was printing and I am totally clueless about where my ink cartridges are. I know they are in a box but which box which is marked "Craft Room". *Sigh* I also don't know where my pencil sharpener is and some of my color pencils need to be sharpened. I started my card by adhering down two squares to my base of glitter card which I've been hoarding for a few years now. I printed my image with a red border. I went ahead and also ran my Stazon ink pad of Blazing Red along the edge to define the edges more. I colored my images. I've been busy decorating outside and inside. Haven't though had time to create decorations. Although I started one to go on the porch light. My big find was this carriage and horse at a thrift store. It is pretty when lit up. Thank you for stopping by and do come back next week. In the meantime I'm off to try to find my crafting toys. Greetings everyone I hope things are going well with you. The holidays are just around the corner and I'm excited to be spending my first Christmas in my own place which means I can decorate how I wish. I also am looking forward to getting my cards in the mail. I think I pretty much have the cards all created. 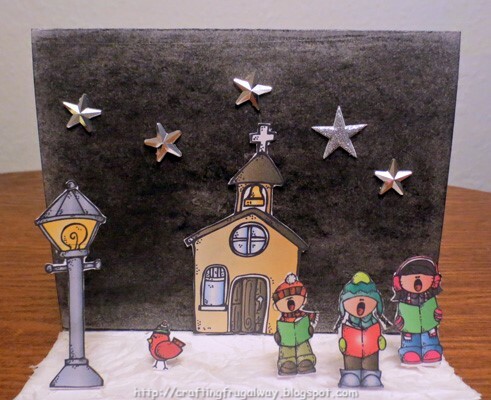 I did take the opportunity to use a cute image by My Besties to make one more card for the Any Holiday challenge over at Hiding In My Craft Room. My Besties is the sponsor and one lucky person will win all three images used by the design team members. Since I still have things packed up I used my printer to print out my background after combining two winter snowy backgrounds into one. Alas my printer ran out of the cyan and my printer did weird things down at the bottom so I printed my sentiment onto a piece of card stock to cover that up. While I was at it I printed out my image. After adhering my background and sentiment down on my card base I inked the edges of the card base with a dye ink pad. I used my tape runner just across the girl's boots. This way she is not totally flat on the card but no bulk for mailing purposes like a foam dot. Hi everyone today starts another challenge over at Hiding In My Craft Room. The challenge this week is to use three designer papers either handmade or commercial. The sponsor is Pickled Potpourri and one lucky person will win a $7 gift certificate. I wish I could say everything is unpacked and organized in my playroom but that is not the case. However I found one paper pad with two designer papers that went together and in my experiment bin found a piece of deli paper I had been playing with acrylic paint on. Pickled Potpourri was generous and provided several different file. I decided to use the snowflakes from More Christmas Shapes and the snow couple and sentiment from Warmed Me Up for my card. I used Silhouette Studio to put together my image. Even if you do not have a cutting machine you can still use the free software. I have the designer edition so it opened up the images in PDF format with no problem. I decided to draw the mat and fill it in that the sentiment is on for a little extra pop of color. As well as to have the lines print for the shape. The mat the image is on was actually painted with green and gold paint. The gold doesn't really show up in the photo. Because deli paper is waxy I was not sure how it was going to take the paint. As well as if the base paint would life or not when sponging another color on. Time to go get busy with more unpacking and organizing. If I'm lucky I'll have everything done by Christmas. LOL! HI everyone! Wow this month is flying by here it is already the second Saturday. Which means it is time to get out those scraps and join in the Hiding In My Craft Room challenge. This week the challenge is being sponsored by The Cutting Cafe. You can find SVG cutting files as well as files in the PDF format. One person who joins in the challenge will win 3 sets from The Cutting Cafe. For my inspiration piece today I used several images from the "Welcome Fall" collection. Each set come in zip files and there are a lot of images to choose from. I started by covering my card base with a scrap of Kraft card stock. Then I added a scrap of red. 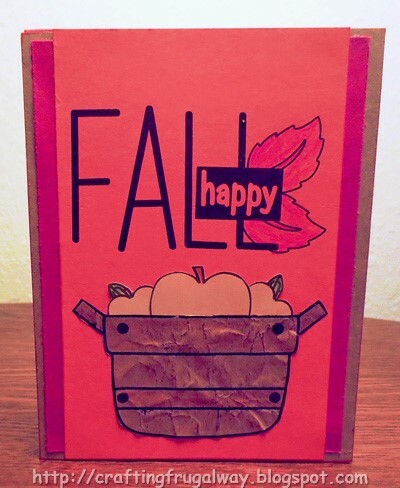 I printed the Fall sentiment on copy paper and then holding it up to the light I taped my orange scrap over the printing using low tack tape. Then printed the sentiment on the orange. I used a pencil to color the leaves. I printed the apples on scrap designer paper after adhering the paper to copy paper using low tack tape once again.. The pattern is really subtle. I colored the stems and leaves with pencil. Then cut the apples out. The basket was printed on wrinkled brown packing paper once again adhered with tape to copy paper first. I used my finger and Vintage Photo distress ink to color the basket. I also used a color pencil. I adhered my apples to the back before adhering the basket to my card front. When printing on scrap paper make sure you have taped it down good to copy paper or card stock so you don't jam it in your printer. You can also print on fabric using the same technique as well as printing on ribbon. Thank you for stopping by. Be sure to come back next week for another challenge. Wishing you Happy Frugal Crafting till we meet again. Hi everyone November is here and before I know it Thanksgiving will be here in the United States and then Christmas. Fall is definitely here as my lawn attests to with all of the leaves carpeting the lawn. Since this is the first Saturday of the month it is time for a color challenge over at Hiding In My Craft Room. Once again the challenge is Fall Colors. This week's challenge is being sponsored by a new sponsor. One lucky person who enters the challenge will win a $15 gift certificate to use. Today my card uses the Cornucopia image which I was provided with. I layered the cornucopia image on my background in Silhouette Studio. Then turned it into a Print and Cut. After it was printed I went ahead and colored with pencils. I adhered pattern paper on my card base before adhering the colored image. That's all for now folks! I hope I'll be able to soon get my "playroom" set up. Wishing you Happy Frugal Crafting till we meet again! Hi everyone can you believe that it is the last Saturday of the month. That means it is time for the Any Holiday challenge over at Hiding In My Craft Room. This week the challenge is sponsored by "Melonheadz Illustrating Designs" . One person who participates in the challenge will have the opportunity to get one black and white or colored bundle. I was sent the Christmas Carolers Colored set for this challenge. I decided to do a modified tent card to use as a decoration. Since my card stock with the glued on tissue paper buckled I ended up having to glue it down to a cardboard base. Although I probably could have used a steam iron before adhering it to the card base and adding my images. That is if I knew where my iron is. LOL! I was going to airbrush my background but right now I have no idea where the adapters are for the different markers. It is going to be awhile before I get my house organized much less my playroom. I also did not know where my blender pads are for using my ink pads. Rising to the challenge I got out my soft pastels as I did know where those are. I took a black one and rubbed it over the card stock. I then took an eraser and erased in places. Then took a paper towel and rubbed over my piece giving me the variations in the night sky. After all the sky is never one solid color. I adhered the church to the sky piece. 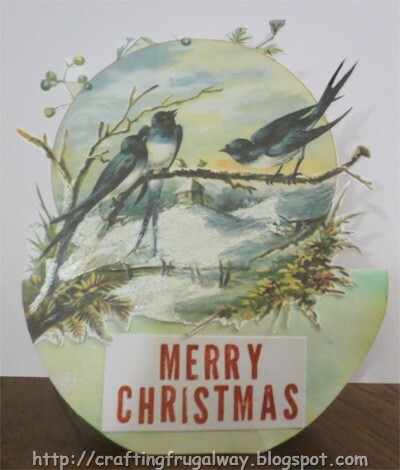 Then added a scrap to the underside of the card base to add my light, bird and carolers. I glued down wrinkled white tissue paper that something glass had been wrapped in. Then cut out my images adding a tab to glue them down with. I then added scraps of the tissue paper over the tabs to disguise them. Otherwise I would have cut a slit in the base and slipped the tabs in the slit so they would not show. After everything was in place I went ahead and added bling stars to the night sky. I felt like the piece needed something as it looked too stark. Thank you for stopping by. Do come back again! In the meantime wishing you Happy Frugal Crafting till we meet again! Hello everyone it is the third Saturday of the month which means it is either a theme or technique Saturday over at Hiding In My Craft Room. This week the theme is Lots Of Layers. 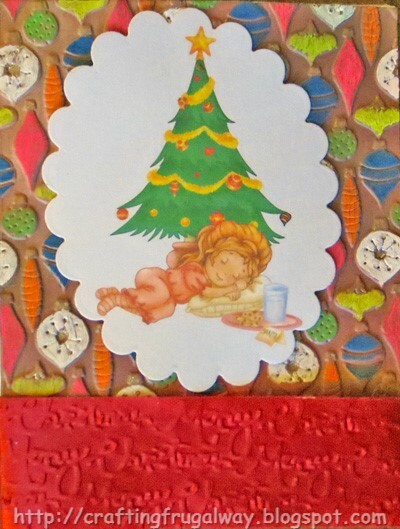 Luckily I found a lot of scraps which worked perfectly with the image I was given by Sweet n' Sassy Stamps. This week's sponsor. The giveaway is three digital stamps. The border at the bottom and the mat the stamping is on was left over from play using Brusho Color Crystals. A scrap of textured card stock was perfect to layer on the top. The mat the Pumpkin Patch digital image is on was an experiment with Distress Ink and Water on an embossed folder. Brown dollar store grosgrain ribbon from my stash to cover seams. The ribbon really is adhered straight at the top my camera likes to make things look crooked. The digital image was colored with pencils and then Burnt Sierra Soft Pastel chalk rubbed over the image and then wiped off leaving a light residue of color. 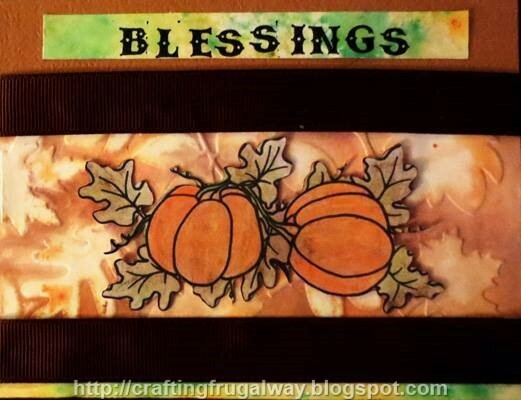 Blessing was hand stamped using individual wood mounted stamps. By the time you read this everything will finally be out of the apartment and then the big job of cleaning begins. Just reading the checkout list of needed cleaning exhausts me. Then hopefully I'll be able to start organizing my "playroom". Hi everyone today is the second Saturday of the month which means it is Super Scraps Saturday over at Hiding In My Craft Room. Time to get those scraps out and craft. This week the challenge is brought to you by MHK Designs. One lucky winner will get to choose three products at the store. With Christmas being right around the corner I thought it would be fun to see what I could do with a couple of digital stamps from the Christmas Frames set.This is such an awesome set that I wished I would have had time to create more cards from the set. I used my plaid scraps and solid green scraps for this card. I placed small scraps behind the punched out holly. I layered the sentiment onto the Wintry Scene Frame. After printing I colored the door and windows with pencils. I used chalk for my gray sky. I used DecoArt Snow Writer to create snow. I love the texture it gives. My snowflakes are left over from another project. I coated them with snow and glitter. I often will cut out extras of a shape to use at a later date. I'm slowly getting moved in to my new house. Will take awhile to get my "playroom" organized. Still have a lot to do first though to get out of the apartment. I think in November I may just hibernate like a bear. Hi everyone can you believe that this month is Halloween. Or that it is Autumn already. 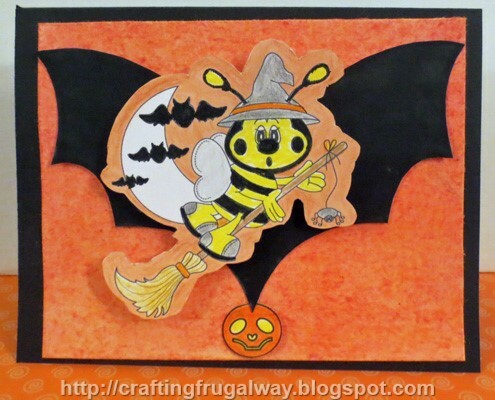 This week the challenge over at Hiding In My Craft Room is Halloween colors. I thought you might be interested in knowing the meaning behind the colors used at Halloween. Green – Monsters and Slime. Scrap N' Dipity is giving away three digital images for one lucky winner. Also today is World Card Making day. If you have time why don't you create a card and brighten up someone's day. 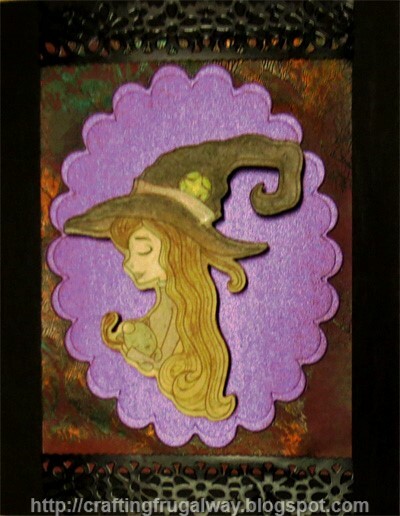 I used the Sicara Witch image for my card. She was printed in sepia tones instead of black and white. You might want to check to see if your printer has an option to print black and white images with other colors instead. Then she was colored with soft pastels as well as color pencils. I have all of this shimmer card stock which I've been hoarding so I thought it would be fun to take a piece of the purple. I cut my scallop out with one of my few Spellbinder dies. The scallop is on a gelli print I did on deli paper using acrylic paint and a stencil. When I pulled the stencil up the metallic acrylic paint pulled up creating an interesting peaked texture. I then went ahead and using a dark red marker airbrushed over the paint after it was dry. Because deli paper is like vellum that must adhesives will show through I adhered it to my black card base using decorative vinyl tape. Time to get back to packing. I swear things in my craft room have been propagating since I last went to sleep. 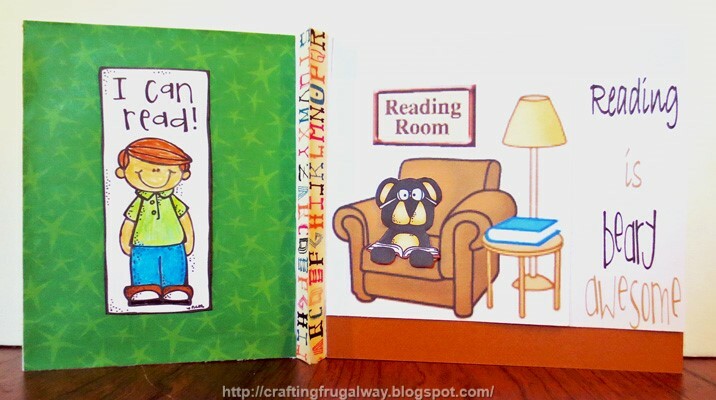 Wishing You Happy Frugal Crafting til we meet again! Hi my dear readers. Sorry I've been missing in action and don't have a project to share today. This month has been a whirlwind of activity. I had not planned to move but after getting notice that the rent was increasing once again I decided to look at buying a manufactured home. The realtor which was doing the showings of available ones suggested I see if I could be pre-approved for a home loan. Not only was I pre-approved but a house was just listed in my price range. Several people looked at the house on Friday so I couldn't see it until Saturday. I fell in love with the house but was so afraid that because it was Labor Day weekend someone else might have beat me to it. There was an offer but the people couldn't get a loan. Since the seller wanted to be out by the end of this month and I was pre-approved after some negotiating we came to an agreement and as Thursday the house is mine. 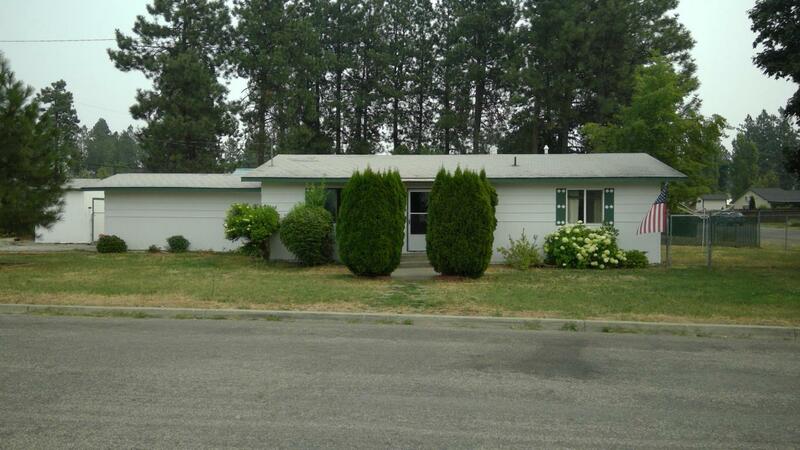 I never realized how much work there was in buying a house. I'm exhausted but alas I need to keep packing up things so I'll be out of the apartment by the end of October. This weekend will be spent doing some cleaning and moving things in. Of course my "playroom" will be one of the first rooms which will be set up and organized. The attached garage has been converted so that will be my playroom. It will be nice to not have everything all crammed together and to be able to set up stations. My fur babies will have a yard to run around in. Lol! It has been several years since they have had a yard so I hope they remember what it is to be free. Thank you for stopping by and do come back next week as I'm working on a project for the design team. 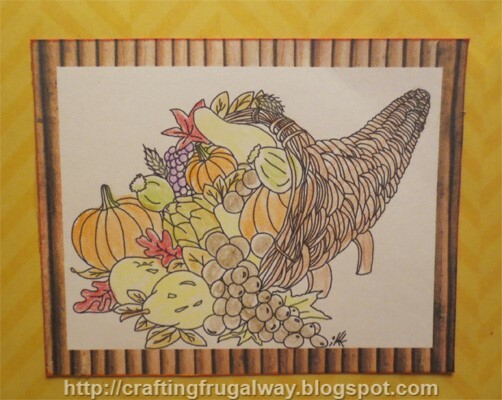 Hi everyone the challenge this week over at Hiding In My Craft is a Fall Challenge. This week the challenge is being sponsored by Star Satmpz. The Give Away is 3 digital images. I love the cute image from Star Stampz I used. It would be perfect for a Thanksgiving card if you make any. For those who have been reading my posts for any amount of time you know I like to play and to use things that otherwise might be thrown away. For my background I took crumpled,torn brown paper which had been used as packing material. I layered paint letting dry in between coats and crumpling the paper. The wet paint kept erasing my wrinkles. With each layer of paint I smooshed plastic wrap.When I would pull the plastic wrap I would pull some of the paint off. For my final layer of paint I made sure that the paper got wrinkled under the plastic wrap. Then after the paint was dry I sponge painted copper paint. After applying my torn piece of paper to my card base I edged and covered where the white card base showed with Photo Vintage distress ink. My leaf background is a photo I took years ago of a pile of leaves someone had raked up. If you are into taking pictures besides selfies you can often create your own pattern paper. Even blurry pictures will work. 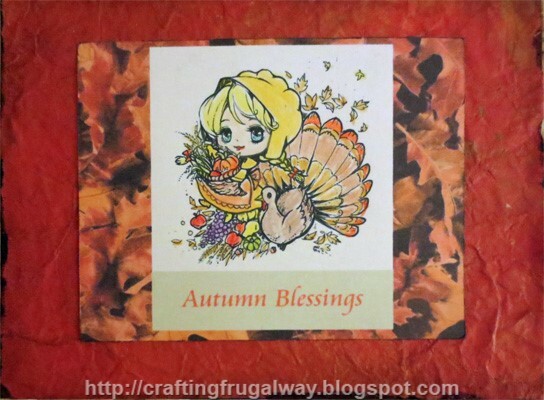 I had created the Autumn Blessings last year in Silhouette Studio so I added it to the digital stamp. I then grouped the two images together and centered them on the leaves image. The image is colored with pencils. It doesn't feel like Fall or Autumn if that is what you call the season where I live. September is being a seductress making me think that Summer will last forever. When Autumn arrives it will be quick and not so kind. I'll go out in a t-shirt to walk the dogs only to realize I needed a jacket. Not only are there changes in the air. I've already noticed a few leaves which Nature has painted. If things go smooth there will be a change in my life. Hopefully by the time I post again I'll have some good news to share. The waiting for things to work out is the hardest. Valentine's Is Everyday "Be Mine"
Hi everyone Autumn is definitely on it's way as I notice that Mother Nature has taken out her paint brush and started painting the leaves. I love living in an area where the seasons change although right now September is being her usual seductress teasing me with the warm weather. This week's challenge is a scrap challenge over at Hiding In My Craft Room. This challenge is being sponsored by Oddball Art who provided the hanging hearts image I'm using. The give away is two images from them. 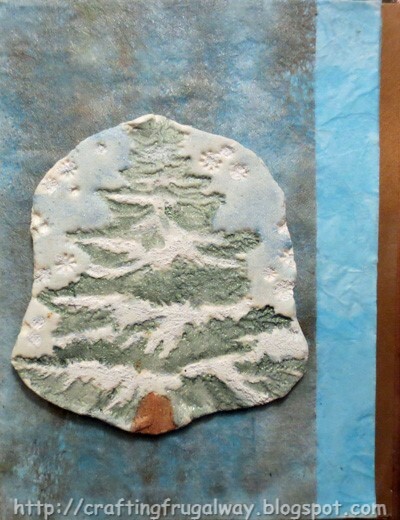 I now know why the textured paper I used for my background was donated to a thrift store. There were several packages of it and probably because it can't be cut. I got better cuts with my old guillotine cutter but the edges were still rough. Luckily I had in my stash the ribbon to cover the edges as well as the narrow scrap which I used a punch on. I opened up a heart file from the library in Silhouette Studio. Then I filled the shape with a polka dot pattern. 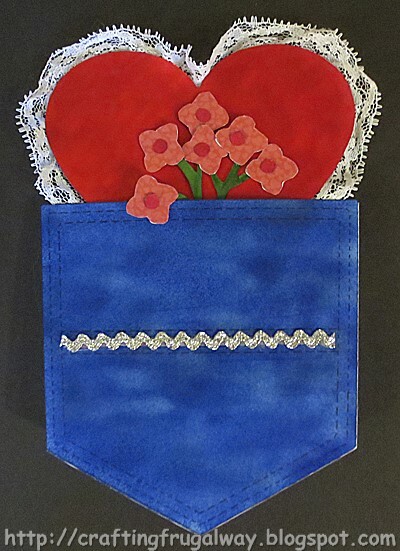 I took the digital image of hanging hearts from Oddball Art and sized it to fit inside the heart.I added the be mine from another file in the library. Once that was done I printed and used my cutting machine to cut it out. I took chalk to color inside the heart. I took a marker and colored the hearts. 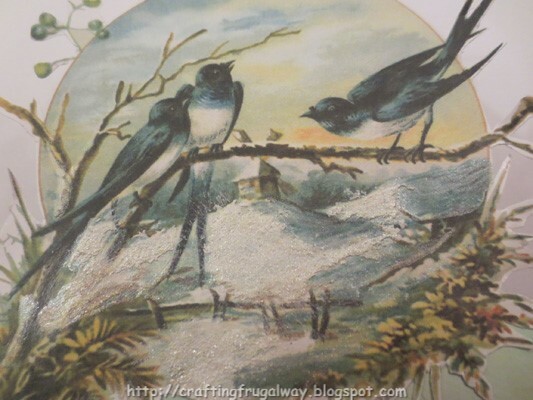 My frugal tip is if you have narrow scraps use them for a border. Punches, dies, or even a cutting machine can be used to create borders. Hi everyone Fall is in the air and it is the perfect time to join in the Hiding In My Craft Room Fall color challenge. This week the challenge is being sponsored by Digital Delights.and one lucky person who participates in the challenge will receive a $5 gift certificate. Not sure of the name of the Halloween image but I think it is cute. Here is my inspiration piece. When I think of Fall colors I think of oranges, reds, yellows, and browns. Because the image is Halloween I threw some black in. For my background I decided to see what would happen covering white card stock with chalk pastels and then taking a wet stiff bristle brush and brushing over it. The brush ended up causing the paper to pill but I like the technique. When the card was dry I went ahead and rubbed yellow, orange and red chalks and then blended. I then rubbed paste wax and buffed it. I love how the areas where it is pilled took on a darker color. The bat and Jack O Lantern is from Silhouette's Bat Skeleton cutting file. I ungrouped the file as I only wanted the solid bat and wanted to cut the pumpkin out by itself as I wasn't sure I was going to use it. I traced and detached the bee in Silhouette Studio after I did some resizing. Then I was able to use the Shadow feature under image effects. I didn't think that there was going to be white spots since I did the outline mode when tracing. After printing and cutting out I used a color pencil to fill in the white spots and to have the shadow all one color. I used both Tombow Markers and color pencils to color the image. Thank you for stopping by. Do come back again! Wishing you Happy Frugal Crafting till we meet again! Hi everyone it is the 4th Saturday which means it is time over at Hiding In My Craft Room for the Any Holiday challenge. The way this year is flying by before I know Halloween will be here before I know it. I don't send out a lot of Halloween cards but I do a few. So when Pickled Potpourri sent me files of images I knew it was the perfect time. By the way Pickled Potpourri is the sponsor for this week's challenge. Be sure to go and check out what they have. They will be giving out a $7 gift certificate. I don't know if I've mentioned it before but I flunked drawing 101 so I often cheat. This time I used a Paper Studio embossing folder and embossed plastic. Then I took Studio G glitter glue and filled in the debossed lines for my spider webs. I adhered the plastic once the glitter glue was dry to black card stock and then glued a frame I had cut out and colored with my eBrush and a bronze marker on top. The frame hides the adhesive marks. 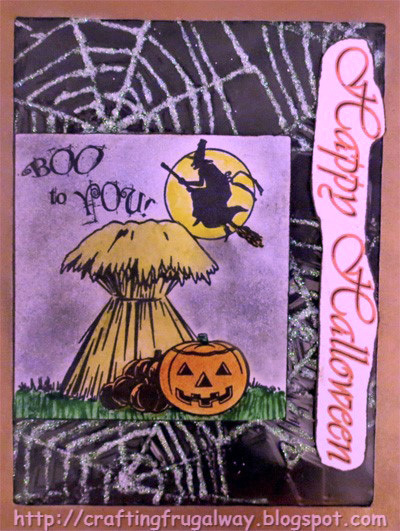 Happy Halloween is from a tag which was a freebie at one time from Silhouette. I printed it out and then decided to cut it by hand free form. The image is the Boo To You file. It comes in both JPG and PNG format. After printing out and cutting to size I took black and violet chalk for my background. I carefully used my fingers to blend being careful to not get the chalk where I didn't want it. I then applied paste wax to the chalked area. Let it dry and then buffed it. Then I was able to go ahead and apply a light coat of paste wax over the rest of the piece.Once dried I used watercolor pencils for the moon and the grass. I dipped the pencils in water in order to color. The pumpkin is colored with Mandarin Orange Distress ink. With all the markers and paints I have you would think I had a good orange. I used Antique Linen distress ink for the haystack but then decided to also use a Spectrum Noir marker. It took longer for the Dimensional Magic to dry for the windshield and headlight than to put this card together. I used Silhouette Studio software. Picked my shape in the library and filled with a gradient fill. I did an external offset for my shape so I could cut it out of pattern card stock. Happy Halloween was from a file in the library. I used the gradient fill to color the letters. 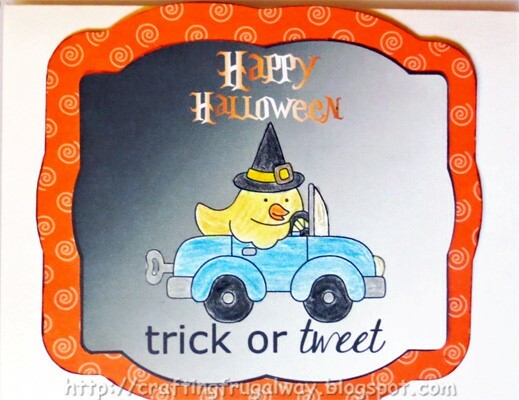 The bird in the car, hat and sentiment is from the Life Is Tweet file. Although the bird in the car and the hat are in png format they didn't work for what I wanted to do. I used the trace and detach function in Studio. This left a transparent background but filled in images. I placed the hat on top of the bird and grouped the two before placing on the background. The trick sentiment is png so worked perfectly. After everything was grouped together on the gradient panel I printed and had just the shape cut out. Then came the fun of coloring with pencils. Adding the clear Dimensional Magic and waiting for it to dry before I put everything together. I'm not sure who I'm going to give the first card to but I know a boy who would love the second card. HI everyone it is the third Saturday of the month which means it is time for either a theme or technique challenge. As I write this the challenge has not been totally decided since we had a problem getting the images. Originally it was going to be Back To School and when the challenge goes live it may well be since many of us worked with the images we already had from the sponsor with that theme in mind. Also this week we did get the images.Thankfully I had left a space in my project just in case I got the images. This week the sponsor is Melonheadz. The giveaway for this challenge is a bundle in either precolored or black and white. When I was thinking of school I was thinking about the importance of reading. In fact reading was so important to me that I spent a whole summer teaching my younger sister who was struggling how to read. I must have been successful because today she enjoys reading just as much as I still do. Some women are not to be trusted with a credit card for me I can't be trusted with a library card since there is no limit on how many books I can check out. LOL! Right now I only have ten items checked out and two of those are DVD's. For me this is a small amount. O.K. enough yakking. On to my project. I hope the library staff will like this card. Bookcase is free clipart I found online. The bear here on the front and inside is from the Bears Colored collection. The word "read" is not included in the set. After cutting out the bear I pop dotted him on the front. 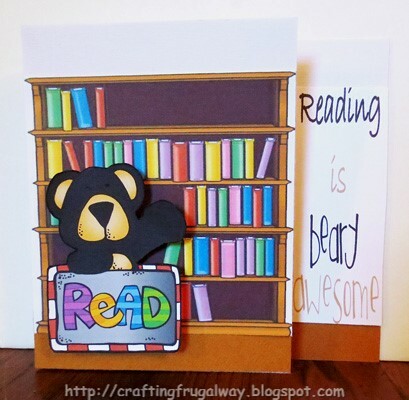 I added "Reading is" to the beary awesome which is part of the collection. The bear does not come with the Reading Room image which I also found online. The boy is from the Library Line Art collection. The line art is black and white. Of course I had fun coloring him. The background from pattern paper in my stash. Also the alphabet washi tape used to cover the folds is from my stash. It is by Studio G.
Thank you for stopping by. Come back soon. Wishing you Happy Frugal Crafting till we meet again! I started by adhering pieces of tissue gift wrap paper on card stock. I then took an unused dryer sheet and with my air brush and a bronze and silver Sharpie added color to the dryer sheet. Then I glued a part of it with school glue over part of the tissue paper panel. I saw in a book where Model Magic had been used on a card and decided to buy some and play with it. After I made my tile I stamped it. I let my tile dry and then painted it with water color paint along with a snow writer. I had so much fun playing with the Model Magic by Crayola that I think I may make charms for a bracelet. Model Magic can be air dried and will remain flexible as well as light weight. It also can be cut with ordinary scissors. That's all folks for now. Wishing you Happy Frugal Crafting till we meet again! Hi everyone this is the second Saturday meaning it is Super Scraps Saturday over at Hiding In My Craft Room. The challenge is being sponsored by Scrap N' Dipity who graciously provided me with Little Witch and Kitty digital stamp. They will be giving away three digital images. Since I had narrow strips of black and pattern orange paper I decided to place them on the diagonal for my background. For my digital image I placed it on a black background and a orange frame on top. 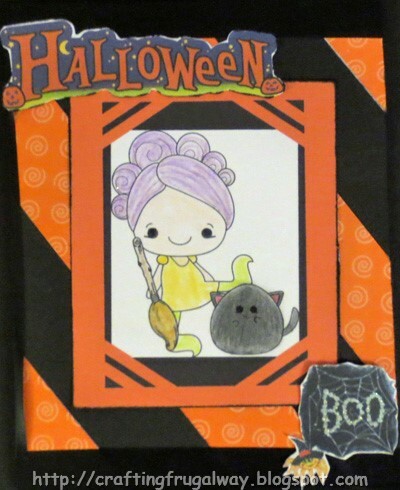 I used a glitter marker on the broom and a glitter pen for the hair along with a color pencils. Alas the sparkle in her hair doesn't show in the photo. The rest of image was colored with pencils. Halloween and the spiderweb with the small witch are Dover Sampler images which I've had in my stash for a few years. I used my glitter pen on the Boo. If you have narrow scrap strips consider putting them on the diagonal. I encourage you to check out both challenges and either get started on creating your Christmas cards or add to your stash. 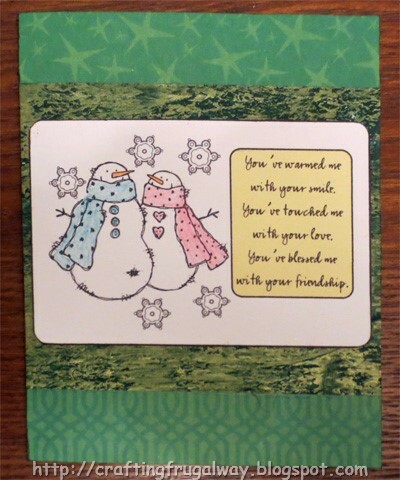 You know the holidays will be here before you know it and if you send cards wouldn't it be nice to have them all done. O.k. enough yakking! Here is the card I did this week. 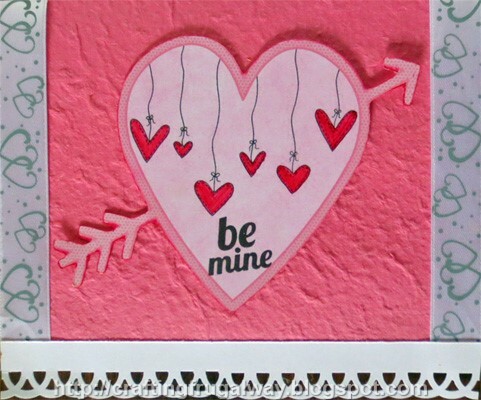 For my background I used a retired Sizzix embossing folder. I thought of sanding after embossing but decided to leave it as it is. I bought this Santa stamp from a friend a couple of years ago and oh the shame this is the first time I've inked it up. The stamp is I believe called Christmas Wish. 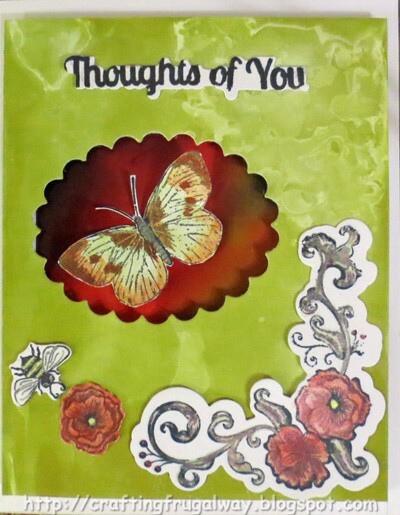 It is by Stamper's Anonymous and it looks like it is available as part of a clear stamp collection by Tim Holtz. I inked the stamp up with Ranger Archival black ink and then colored using Tombow markers. I managed to score a couple of sets this week at Michaels on sale. I hope you are finding time to craft as Summer quickly winds down. Wishing you Happy Frugal Crafting till we meet again! Hi everyone I'm once again caught up with my obligations for the design team so while I wait for images I thought it would be fun to play and enter a couple of challenges. While searching for challenges I found a site which has challenges using stamps which are a year or older. The challenge right now is colors. I love playing. Both the window panel and behind the window was created using glossy photo paper which is waterproof. On a piece of plastic I dropped drops of moss green re-inker. Then I dropped water on the plastic causing the re-inker to spread and placed the photo paper in the ink. While still wet I quickly placed plastic wrap. For the window backing I used the Moss Green and Festive Berries ink. I used a Spellbinder die to cut my window. Then used double sided foam to attach the red panel. For my butterfly I used the first rubber stamp I bought back in the 80's. Although the copyright is 1981 I think it was more like 1982 or 1983 when I bought it. Alas as far as I can tell the company in Seattle Washington is no longer in business. I stamped it with Ranger's Archival Ink. Then I painted it with iridescent pan watercolor paints. The sentiment, flowers and bee is from Simply Defined Aviary Blossom,Floral Corner Set which I found this week at a thrift store. After stamping and cutting with the dies I once again painted with the pan water colors. Hi everyone can you believe it is already the first Saturday of August. With it being the first Saturday that means it is a color challenge over at Hiding In My Craft Room. This week the challenge is being sponsored by The Cutting Cafe who generously supplied me with the Pocket Shaped card file which I created my inspiration piece with. Even if you don't have a cutting machine you can use the files from The Cutting Cafe. One lucky person will win three cutting files. I had to use a lighter blue as the navy blue was too dark and covered the print lines but I tried to come close to the rest of the colors For some reason my camera wouldn't photograph the red as dark as it is on my card.. Here is my inspiration piece. There are so many pieces in the Pocket Shaped card file that it was difficult for me to decide which to use. I finally decided on the back pocket shaped card base along with the printed pocket topper. I used two different blue Spectrum Noir markers along with the blender marker in my eBrush in order to create my pocket with the look of being denim. After airbrushing I happened to spy a scrap of rickrack which was perfect both in the length and width. Sometimes it pays to hoard small scraps of trim. LOL! As well as to shop for trim from your stash like I did with the lace for the heart. Adhesive was adhered everywhere but at the top of the topper leaving an opening near the fold of the card base forming the pocket when placed on the card base. The file comes with the flowers and stems all as one as well as with separate pieces. I decided to piece my flowers together. After the pieces were cut out I airbrushed the stems trying to get as close as possible the green for this challenge. I decided to use a muted pattern paper for the flowers. I glued squares of the paper over my cutout flowers and trimmed the paper. I didn't get the paper down tight in places so in places the white of the card stock shows but I decided that it is time I stop being such a perfectionist. I used a dark red marker to color the dots for the center. I placed the flowers in the pocket but decided I either needed to do more flowers or add something. I opened up the misc file which comes in the set and there was the heart. After cutting the heart out I doodled with my airbrush and a dark red marker. Then after placing it in the pocket to see how it looked decided to add narrow lace around the heart. I normally don't use these colors and to be honest I probably would not use this combination. Sometimes though it is good to get out of your comfort zone and use different colors and combinations. I encourage you to try creating with colors you might not normally use. Hi everyone today is the fifth Saturday which means it is Freestyle challenge over at Hiding In My Craft Room. The design team all month have been creating projects using Christmas in July as the theme. I've had a lot of fun and now am ahead doing my Christmas cards. For this challenge I was given Season Greetings which was just released last month. I've had so much fun with this set and I think this is going to one of my go to sets to use for creating Christmas cards. I had fun doing the background. I wish you could see all the silver lines and shimmer from using Liquid Metal as water color paint and crumpled tissue paper. I used a scallop circle from my library in Silhouette Studio. At one time the nested scallop circles was a freebie. There is no rule that you can't by stretching turn a circle into an oval. I then filled my oval with gradient colors. I resized my image in Silhouette Studio to fit into the oval. Then using the image effects option I turned my black and white image into a green one. Then after printing and sealing my print the fun began. I used Peeled Paint distress ink as paint and a tiny brush to add more color to the tree . I used Dollar Tree watercolor pencils for the bird and the burlap fabric around the tree wetting the tip first. I hate to admit it but I like these inexpensive watercolor pencils better than some more expensive ones I have.. 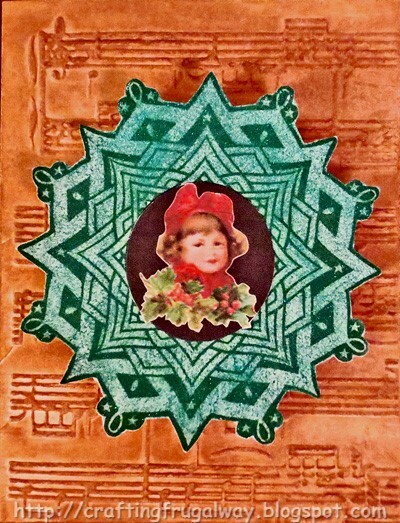 The ornaments and star were painted with Inkadinkado iridescent watercolor paints. Wish the photo showed the beautiful sheen. 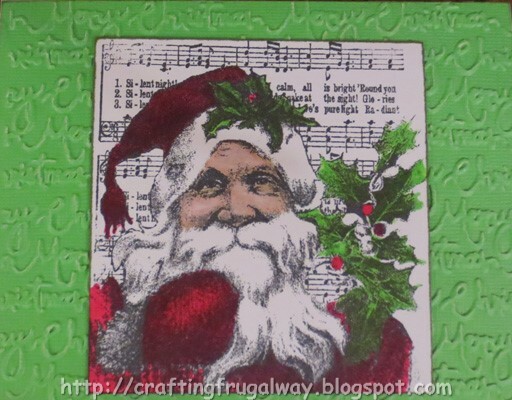 For my next card I decided to use the vintage looking Santa along with the NOEL sentiment. At first I was going to leave the Santa uncolored but decided to go ahead and color. I decided to go with a blank background only wrapping decorative ribbon around the card base. The ribbon was a lucky find at a thrift store recently. In Silhouette Studio I drew my rounded corner shape. Then I did an internal offset to create a smaller shape. The large shape I filled in with a pattern instead of cutting it out of corrugated cardboard since it would be flatter for mailing. The smaller shape was filled in with color. 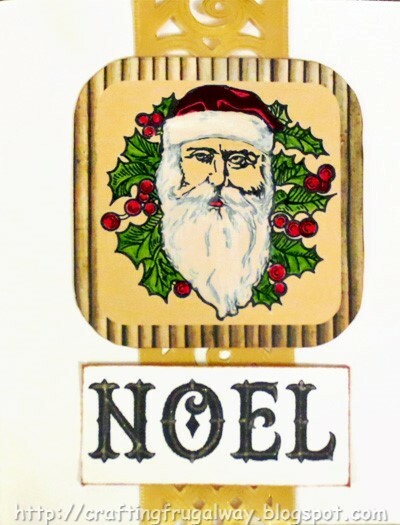 The two shapes were grouped together and the Santa which came in png format layered on top. 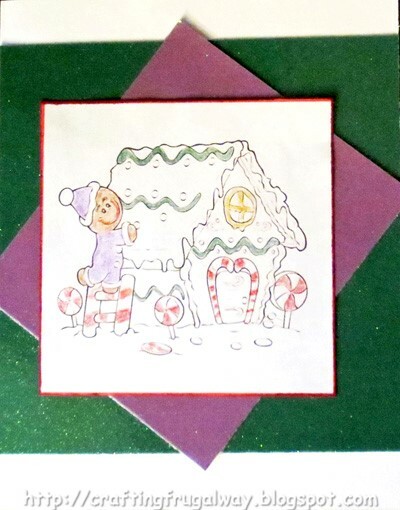 Although I had played with doing the lines of Santa different colors I decided to stick with black lines for this card. After printing and cutting out I lightly rubbed paste wax over my image. When dried I buffed and started coloring with .Spectrum Noir markers. One advantage I discovered of using the paste wax was the markers easily glided on and there was no bleeding through to the back. I brushed on Faber Castell white water color with a fine brush for the fur and facial hair. I had to paint several layers using an almost dry brush to try to cover the background without losing the details. Now that I've learned how to color inkjet prints with water color paint I'm having fun. I left NOEL the size it originally was. After printing out I used a clear glitter Gellyroll pen by Sakura to add detail. I cut it to size and inked around the edge with distress ink. I think either matting or edging with ink adds a little bit of a professional look to things like sentiments. 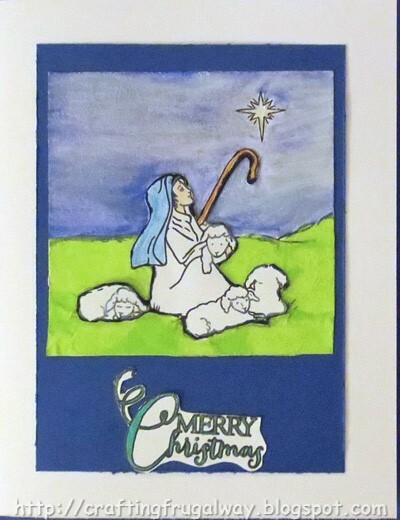 Thank you for stopping by I hope I have inspired you to create some Christmas cards. Wishing you Happy Frugal Crafting till we meet again! Hi everyone as hot as it I wouldn't mind if it was cooler. I was really thinking when I finished the first card that maybe I should have done one with snow. Lol! So I did. With this being the fourth Saturday it is the Any Holiday challenge over at Hiding In My Craft Room. Those of us on the team have been asked to do Christmas or whatever Winter Holiday we celebrate for our inspiration piece. 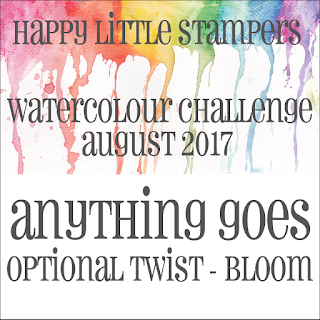 Laurie from Hiding In My Craft Room will be offering the prize for this challenge. 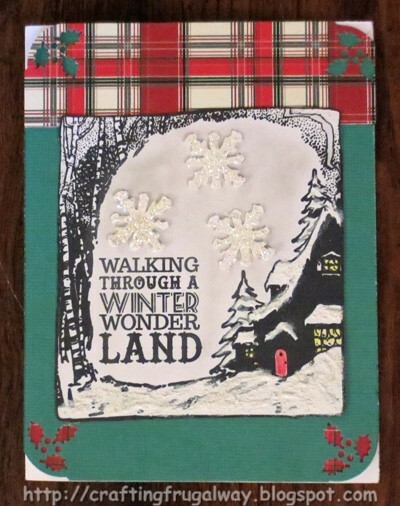 I went and embossed with a Darice embossing folder my white card base. Then I applied two different colors of Soft Pastels. I blended with a soft cloth. Then I went and applied two coats of Paste Wax. Buffing in between. The first coat blended the Soft Pastels even more. Buffing the second coat added a subtle sheen. If I wasn't so lazy I would have added more coats of the Paste to create more of a patina. I opened in Silhouette Studio two images from Dover. 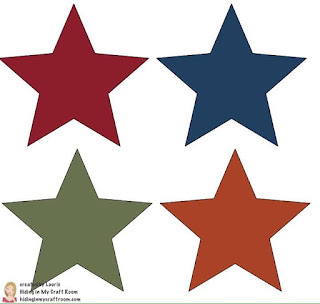 I was fascinated with the star shape but it had a different circle image. When I saw this sweet girl with the holly I decided to use her. I drew a circle and filled it with black. After tracing and detaching the girl from the background I added her to the black circle. I decided to make the circle larger than the one on the star shape as well as to have the holly overlapping the circle. I took the star shape and in the effect mode tinted it green. After printing and cutting I applied a layer of paste wax before brushing on aqua Extreme Glitter. I wish you could see the jewel look of the star. The circle was printed and cut out and adhered in the center. When I saw this vintage bird image at Graphic Fairy I knew I wanted to use it. I've been wanting to do a half circle card and knew with the image detached from the background this would be perfect. After drawing my circle and detaching the partial circle bird image in Silhouette Studio printing and cutting them out I started having fun. I wet the circle and brushed Ken Oliver Liquid Metal on the front. Then I wrinkled tissue paper and covered my circle letting it dry. The tissue paper lifted some of the medium giving me a really soft look. I wish you could see the sheen I got from the liquid metal. When dry I folded my circle in half. The I realized I would have to have a section of the bottom trimmed off so my card would stand up. Not wanting the ink to bleed I went and applied paste wax over the image after cutting it out. Once the wax was dry I buffed it. I managed to find my DecoArt Snow Writer but it would not come out of the nozzle even after I cleaned the nozzle. I unscrewed the nozzle and with a toothpick and my finger applied snow where there was snow in the image. I love the realistic texture it gave. After my snow dried I went and brushed Liquidtex Iridescent Medium over the snow and where the shadows are on the ground giving a nice sparkle and sheen. You can sort of tell in this closeup. Using my new toy the typography plate from the Precision Press Plus I lined up the letters and stamped my sentiment using the letters that came with my press. Since it was my first time I didn't want to stamp directly on my card. There you have it my fun elegant vintage looking cards. Have you started making Christmas cards yet? Hi everyone it is now the third Saturday in July and that means either a theme or technique challenge over at Hiding In My Craft Room. This week the theme is Christmas or any other holiday you may celebrate in the winter. The sponsor is The Paper Shelter who has provided the images for those of us on the design team. One person will win a $15 gift certificate. 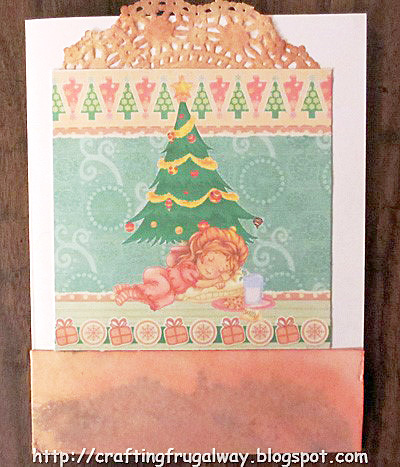 I decided to create two cards using the same image for both also adding a digital Christmas paper for one card. I love this image of the girl who fell asleep waiting for Santa. I love how my background turned out. I wasn't sure if I was going to get a nice brown shade in places or a muddy looking brown. 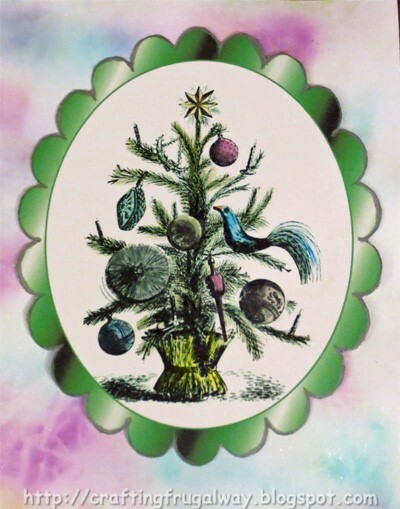 On a sheet of plastic I dropped Evergreen and Festive Berries reinker. Then misted the plastic and with a chopstick swirled the ink around. Then I pressed my card stock which I had sprayed with water on both sides into my mix. (I've discovered if I get both sides of card stock wet there is less chance of buckling.) While still wet I put it in a retired Sizzix folder and embossed. I kept it in the folder until it was dry. Then colored the ornaments with gel pens. The silver hangers don't really show in the photo. As long as I had my embossing machine out I decided to see if I could emboss ribbon. I found a spool of red ribbon which is stiff. I took another retired Sizzix folder to emboss it with the Merry Christmas all over it. Now that I know it works I'll be looking for more stiff ribbon and perhaps using spray starch on some I have in my stash. I found a small doily which I had played with coloring using distress ink and water. I then stamped and it didn't work out. However, I didn't want to throw the doily out so was able to salvage part of it. The bottom strip was from my mopping up the ink from the plastic from the previous card. I liked the way it turned out. I took the color image and removed the white background. I then layered on top of a digital Christmas paper. You can often trace in Silhouette Studio and detach to remove the background. You can also use a program like LunaPic online to turn the background transparent and save. There you have it my two Christmas cards using a digital stamp and digital paper by The Paper Shelter. Have you started creating your holiday cards yet? Hi everyone I hope you are staying cool. The weather gets hotter every day. My poor boys don't like it as our walking schedule is all messed up as I'll only take them out in the afternoon for a quick potty break. So far with thermal drapes my playroom has been staying cool but it was dark before and is darker more so now. Getting down to business here. This week Hiding In My Craft Room Super Saturday Scraps is being sponsored by Sweet 'n Sassy. The prize for one lucky winner is 3 digital images. Get out those scraps and join us. As my post titles mentioned with a twist. This month those of us on the design team will be featuring Christmas inspiration pieces. Lol! I'll actually be ahead of the game once holiday time rolls around. Especially since I created two cards for this week. If you want to know how to water color on an ink jet print,apply glue etc. I'll have information at the bottom. 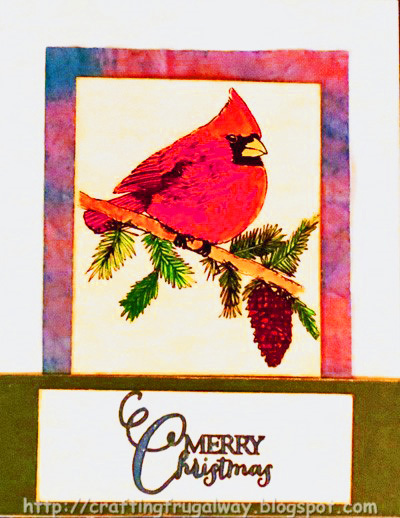 I used water color paints on the Cardinal Sweet 'n Sassy digital stamp image and I couldn't be more pleased. To start out since this is a scraps challenge I looked through my scraps. I found a pink piece which I had debated about tossing after my dog decided to lay on top of it on the table where it was. Needless to say with his trying to nest with it on the table it was not a pretty sight. There was also a narrow strip of the green. I'm terrible about hoarding paper scraps but nothing goes to waste. I blame it on my Mom who would use envelopes to write her lists on or even sometimes to write a letter to a friend. I wet the pink paper and the dye started bleeding like crazy. Luckily I did it over the kitchen sink. I went ahead since the paper already had creases to crumple it up. I then un-crumpled it carefully since wet paper is delicate. After smoothing it out on my counter I sprinkled Brusho pigment powder and misted with water where the pigment had not dissolved. I then placed a piece of inexpensive plastic wrap over and piled books on top. I let it dry for 24 hours and when I removed the books and plastic wrap my piece was flat with beautiful veins throughout. Next was the fun part of coloring my Cardinal image after printing on 110 Georgia Pacific white card and sealing. The side benefit of sealing was that the card did not buckle like what usually happens when paper gets wet. I used Faber Castell pan water colors. I love the bright highly pigment paints which blend so easily. I've used other pan watercolors over the decades but until now kept going back to the tube water colors. I printed out the sentiment which was at one time a free Silhouette Studio file. I then filled in with a Gelly Roll blue pen. I inked the cardinal panel, the green mat, and the sentiment panel with gold ink. I had so much fun doing my second card here. Even though it was a little time consuming to do the hills. LOL! Not as time consuming though as making a picture out of the circles from a hole punch. I found a scrap of blue which was perfect for my mat. I took my scissors and distressed the edges. The sky was painted with water colors and a water brush. I added first a dark blue then after it dried I painted a metallic. The sheen doesn't really show in the photo. Nor does the glitter paint I used on the star. I took my second print and colored with pencils. Then cut out and edged with a black marker to add dimension. My sentiment was an extra print. After coloring with a gel pen I cut free style. Are you ready to discover how you can use water techniques, glue etc. with ink jet prints? Of course you are. Especially if this has been frustrating you for as many years as it has me. It is really easy to do the hardest part may be to find the product to seal the ink jet print first if you don't have it. That product is Paste Wax. The wax used for waxing wood, leather, metal, etc. (I don't know if car wax or neutral color shoe wax will work.) The next hardest part will be opening the can. Several of my fingernails became causalities but that is the price you pay sometimes when you want to be crafty. Taking a paper towel or piece of cheesecloth rub the Paste Wax over your printed image. (lightly apply the wax as too heavy an application will make the paint puddle more) Let it sit for a few minutes and then go ahead and buff it. I went ahead and also did the back but that probably is not necessary. If you printed on copy paper your paper will be more transparent than if you printed on card stock. Now you can paint with your water colors like usual. I did have some puddles but they were easy to take care of with a dry brush or edge of a paper towel. I even used the brush I had picked up color with and painted with in another area the color I picked up. I used water brushes for my painting. I don't know if the bristles on other brushes would make a difference or not. I find for myself I have more control getting the paint only where I want it with the water brushes. You can also use the wax when you want to apply glue like I did for the tissue wrapping paper., glitter glue, etc. Thank you for stopping by and do come back. I hope I've inspired you and if you wanted to know how to use water with ink jet prints I've enlightened you. Wishing you Happy Frugal Crafting till we meet again! Hi everyone today is a color challenge using beach colors over at Hiding In My Craft Room. I know Alice usually has blonde hair but going with the colors for the challenge she had a dye job. I had fun using both this image by My Besties and using the challenge colors from the photo on my card. My Besties is the sponsor for this challenge and the winner will get all three of the images used by the Design Team. Here is the photo colors for this week's challenge. After printing Alice out on 110# card stock I carefully taped with painter's tape a oval chipboard photo mat where I wanted it. Using an embossing mat I then ran my card stock through my Cut N' Boss embossing the oval. Then I took chalk and chalked around the oval leaving a white shadow since the color inspiration piece has white in it. 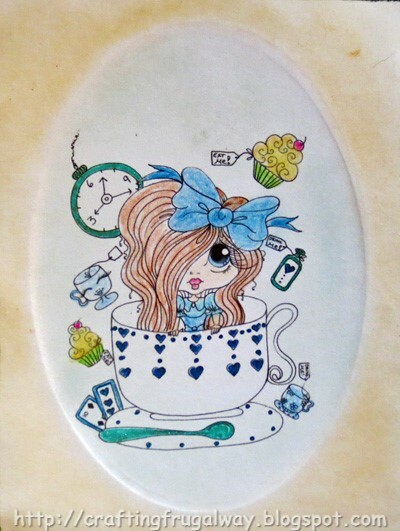 I also chalked blue chalk for the background of my Alice image. Coloring was done with Gelly Roll gel pens and pencils. Hi everyone can you believe that today is the last day of June. Will someone please slow down this year it will be holiday time at this rate before I know it. 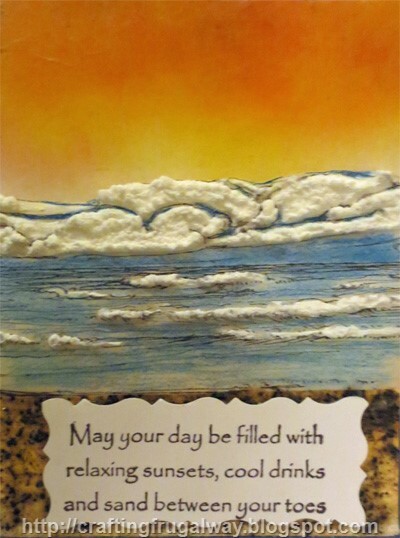 I'm still waiting for images to do projects for the design team so I thought I would do a card for Shopping Our Stash Lazy Summer Days challenge. The challenge is to create a project either of what you will be doing or would like to do this Summer. My first thought was go to the ocean. As some of you know I didn't leave my heart in San Francisco I left it at the ocean the very first time I saw it as a child. O.K. be prepared to pick your jaw up off the floor after the curtain lifts. I know I'm biased but this card turned out better than the one in my head. In fact I managed to capture the sunset that is in a photo I took during my last beach trip. Lol! Now I don't want to give it away. *Music plays as the curtain rises. * Ta Da! I started by airbrushing two different shades of pink on my card stock for my sunset. I then air brushed a dark yellow on "patty paper". The paper which goes in between hamburgers. I glued it onto my card stock using white glue so it would be more transparent. I airbrushed my sand. Then I took recycled coffee grounds and mixed them into Matte Medium which I brushed over my airbrushing. The Matte Medium dries clear so shows whatever color you use. I really need to buy some sand but a friend reminded me there are some beaches with dark sand. I flunked 101 drawing so after doing some modifications to an ocean image I printed on patty paper. I then applied white Radiant Neon Amplify and used my heat gun to puff it up. I then took two different blue color pencils and filled in the water. After I was done I cut around the top breakers and wrapped my image around to the back of my panel where I adhered it. Then the only thing left was to stamp my sentiment. I used a Just For Fun stamp and Stazon Timber Brown ink. I cut around using fancy scissors which reminds me of waves. Adhered it to my card and I was done. My days will be full of relaxing sunsets while I drink cool drinks on my patio. Who knows I may even go to the park and walk through the sand box barefoot. Lol! I may even put on a CD of ocean sounds and close my eyes opening up my mental scrapbook of days spent at the ocean and be there once again. Hi everyone I'm still waiting for images for my Design Team so decided I would play with metallic pan watercolors. As well as experiment to see if a stencil could be used as a stamp and heat embossed before painting. It was a learning experience and next time I'll use a brayer to apply the ink to the stencil so I get better coverage of ink and embossing powder. The copper water color came to the rescue covering the white areas. I took my VersaMark embossing ink pad and stamped it all over the stencil. Then I took the stencil and turned it over to the ink side and laid it down on my card stock. I took a rubber brayer and rubbed the stencil down being careful to not move it. Then lifted my stencil up and heat embossed like usual. I have no idea who makes this copper embossing powder. I've had it now for several decades. Since I had my metallic water colors out after touching up my embossing I went ahead and used the colors for my panes of glass. I decided using one of my water brushes to not go for a complete coverage of color in each open area. Instead I wanted it to look like glass I used to have back in the days when I was making stain glass articles. 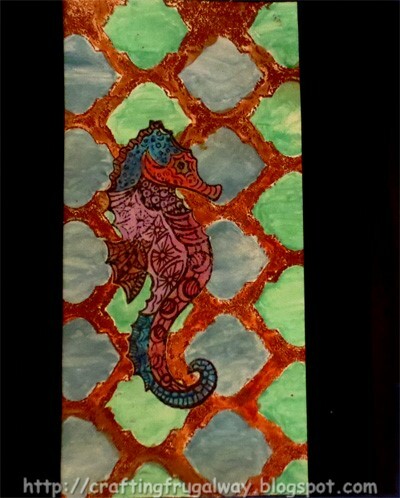 The Seahorse is a Just For Fun stamp. I used Stazon Timber Brown ink on Patty paper.. Using color pencils I colored some of the areas on the reverse side only and other areas on both the front and back.. Coloring on the back side only gives you a lighter more pastel look. Coloring on the front and back gives you not only darker but more vibrant while still allowing patterns to show through. Since I didn't want this to be transparent and had not used a waterproof ink I ran my Seahorse after cutting out through Xyron Creative Station. Tip: If you use waterproof ink and a glue which dries clear your image will be transparent. Most tape runner adhesives will show through. I have not tried yet adhesive for vellum. What do you think? Are you going to see about using a stencil as a stamp and heat embossing?